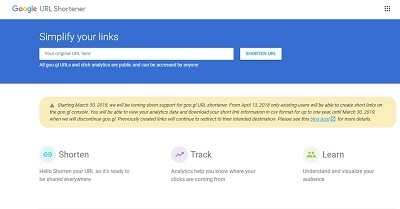 In 2009, Google introduced its goo.gl URL shortener, being one of the first companies to offer such a service. Since its inception, a multitude of companies have come about to provide a similar function. This is good because Google is going to stop using its goo.gl as of March 30, 2019. By discontinuing the service, it will allow developers to focus on Firebase Dynamic Links API. Both developers and users have 12 months to use the service, but if you have yet to use the shortening extension before April 13, you can figure using it after that. Still, Google is not planning on making money off the goo.gl links already out there, which means they’ll still work, but no new ones could be created. While this could be upsetting, it really isn’t that big of a deal to the numerous other URL shorteners that are available. Google is recommending people to use Ow.ly or Bit.ly, but there are others that can be tried as well. Both options, however, provide analytics to people who need them. Google is going this route to encourage developers to use Firebase Dynamic Links – the new link formats that let app and website developers to use one link for many destinations based solely on context. Links could send people to a certain area of an app or webpage. While it’s an alternative to regular users, Bit.ly and other similar services could offer the same functionality. Posted by News on Apr 1 2018. Filed under Featured, New, Sci/Tech. You can follow any responses to this entry through the RSS 2.0. Both comments and pings are currently closed.